Those who have gained the knowledge of the teachings of Jesus and seek to follow him fully, and in humility, can truly become whole, perfect and complete in Godliness. Jesus was the perfect example through which we can know and see how God wishes us to act, live, to relate to others, and to die. It is in this context that we can begin to understand the otherwise "difficult" saying of Jesus: “I am the way, and the truth, and the life. No one comes to the Father except through me" (John 14:6.) The rarely-quoted next verse reads: "If you had known me, you would have known my Father also. From now on you do know Him and have seen Him." Seeing and learning without acting upon what we've seen and learned is pointless, and useless, leading to dead faith (James 2:20; 26.) We cannot hide our Light, or keep our Good Works to our selves, but instead, Jesus calls us to spread goodness and light to others (Matt. 5:16.) It is only by action that we spread God's Kingdom upon the face of the earth. The Good and Beneficial Message proclaimed by Jesus wasn't to simply have mere belief in his existence, but was a call to ACTIVELY serve God, to follow Jesus, and to love others just as we love ourselves (Mark 12:29-31.) His Gospel calls us to serve and act, not sit and contemplate, nor to simply admire Jesus nor even to worship him. 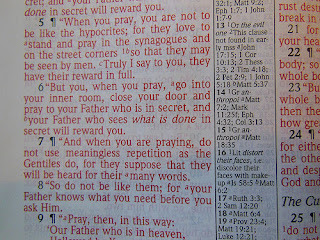 When we realize the wonderful gifts God has given all people from birth - but we have not used to benefit others until we knew Jesus - we should feel a great sorrow of realization, followed immediately by great joy that we now know the goal for which we were born, and the Good Works for which God has equipped us! Jesus is a "Door" and a "Gate" by which we may walk through and glimpse the potential life for which God has equipped us - and has promised to continue to equip us. Let us have the courage to walk through this narrow passageway and enter into spiritually complete and morally useful lives together! It is said that a sculptor was asked how he carved a great work of art out of a large slab of marble. He replied that he simply carved away all the parts that were NOT part of the sculpture. Jesus calls us to an authentic Faith - a Faith of action that sheds those things that are keeping us from becoming spiritually complete. There is within us an ideal person - the person God created us to be, and one that God KNOWS we can be. When we allow the inauthentic and false parts to be chipped away, our authentic and true selves emerge. Today, when we hear that we need to be "authentic," many imagine that this has something to do with our clothing and how we present ourselves to others. While that's somewhat true, in Faith, wearing a more authentic set of clothes can be a new, trendier way of continuing to mask false beliefs and attitudes. 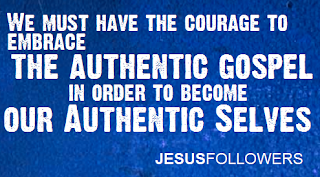 Jesus often spoke of being "true" - by which he meant we must be genuine and authentic both on the inside and out. Jesus called out the Pharisees for being inauthentic. They were like tombs on the inside and all bright and shiny on the outside. He wasn't calling for the Pharisees to also become rotten on the outside, as well as on the inside, so that they "matched" - although that certainly would have made them "true to themselves" in one sense. He was instead calling on them to carve away all the non-ideal portions of their attitudes, beliefs and behaviors. Our false and ungodly parts have perhaps been with us for many years; attitudes, beliefs and behaviors that are false and hinder our spiritual growth have encrusted us like shavings of marble that cover our true selves and keep us from God, as well as from Godliness. But draping trendy clothing on a slab of marble that is encrusted like this will not help. How silly it would be for an artist to simply cover up a slab of marble with a sheet or a jacket and say "I'm done!" or "It's fine just the way it is!" And yet, there are those in christianity today who believe simply wearing cooler clothing, using more "relevant" cultural references and having a rock band perform during a church service will make what they're saying better and truer. It does not. Like the Pharisees, who took away the “key to knowledge,” and failed to guide others to it (Luke 11:52) many today claim that the path to salvation is easy, and the gate to Heaven is wide - requiring no changes WITHIN us and nothing FROM us. They are not speaking to us about the knowledge of true and authentic Righteousness Jesus calls us to seek, so that we may achieve spiritual completion in Godliness by transforming our behavior. No, instead, they condemn and even ridicule the Good Works Jesus tells us we must perform in order to become lights to the world (and to achieve salvation with God eternally.) And they are doing it, not with the Puritanical clothing, stern words and majestic organ music of past generations, but with blue jeans, accompanied by rock music and a light show. One has to think that it's not even the hip clothing and shiny, large buildings that are offensive to God - because styles of clothing and music certainly change - but it's the wicked lies told by the hiply-dressed pastors within them that are truly offensive. Spoiled milk poured into new cartons is still spoiled. 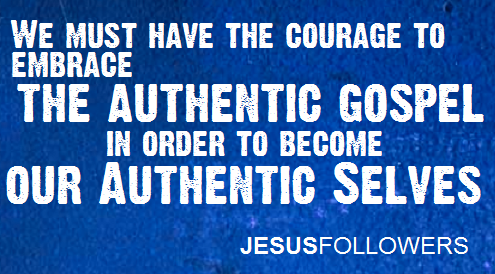 We must have the courage to embrace the Authentic Gospel in order to become our Authentic Selves. Jesus calls us to be authentic, and that starts with knowing God - the one, authentic, indivisible God of Israel. It starts with knowing the man Jesus, whom God chose and commissioned from among us human beings to be our template and example to follow in all things. Jesus calls us to be fully transformed and changed by his teachings, and these teachings of his are the only basis for an authentic faith in his God and our God. These words of Jesus call us to action, not just to change our clothing, but to change our lives, to change our attitudes, to change our behaviors, and to shed our false but stubborn beliefs, so that we may become the authentic human beings God wants us to become. We can be assured that in our lives, we will face trials and troubles, conflict and chaos. But we know that God will always be with us as a source of comfort and strength. We are confronted with unpleasant and angry people, at work and in our families. 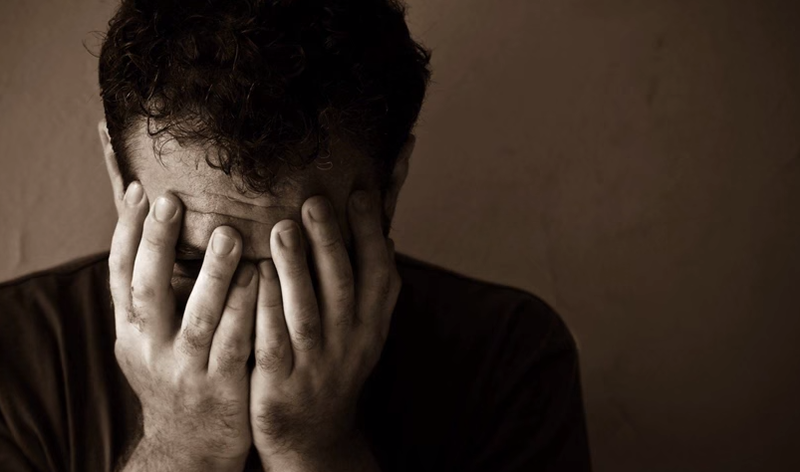 We are torn by indecision and conflict, both within ourselves and among others. We are given chances to lives immorally and treat others unjustly. And we are faced with challenges that threaten our passion for righteousness and goodness. But God is with us as our source of strength and wisdom, to guide us in times of trouble. Jesus, the one whom God chose to be our example and teacher in all things, says we can call upon God in prayer when we need strength, peace and comfort. To hope for a life of ease, without any problems and a guarantee of wealth, power, health and fame is not the Way Jesus promises us. Instead, Jesus tells us what the Prophets of old told us, that we are not alone because we have God with us. We are to find peace not in a vague IDEA of Jesus, but in the life, message and death of this man that God chose and sent out to us as a supreme example. Peace, or "shalom," was, and remains, a greeting for the Jewish people. It signals that God's peace is with us, and that we may take comfort in God's sheltering arms. Again, Jesus calls us to hear his words and understand them, bearing fruit and harvesting good works in this world. But when we allow his words to fall on rocky soil, "when tribulation or persecution arises on account of the word" that person "immediately" falls away (Matt. 13:20-23.) We must instead by firmly rooted in the teachings of Jesus and the knowledge that God has given us through him and through the Wisdom of the Scriptures. When we trust in God and follow the one whom He has chosen, we need never fear whatever the world throws at us, because we can endure to the end. And yet, with a perverse sense of self-entitlement, some make God into their own Servant, rather than making God the object of our service and love. We are called to fully serve God and fully serve our fellow human beings. But many in Christendom - the modern bearer of the Christ's name - often find a way to make our lives, and our faith, all about serving and enriching ourselves. This perverts the Gospel Jesus taught. If your "Church" is telling you that you are ENTITLED to material success, then your church is speaking against Jesus. If your "Church" is telling you that you CANNOT be Righteous, and that Jesus did all the "work" of "being righteous" FOR YOU 2,000 years ago, then your "church" is lying, and the entire message of Jesus testifies against this horrible doctrine. It is the one who does Righteousness, not the one who merely says they "have it", that actually is righteous (Matt. 5:20; Isaiah 33:15.) Jesus said we must stop sinning and serving the Self, that we must turn instead to God, and begin seeking (and doing) Righteousness, serving God and obeying God’s commands. And if your "Church" lashes out at the concepts of Knowledge, Wisdom, and following the Teachings of Jesus and instead says it's okay to be selfish, this is a place isolated from God's Will (Prov. 18:1.) Again: RUN AWAY. Fast. What does all this mean for us in our daily lives? Is this HARD? Yes, it can be hard to put others above yourself. But we were never promised a wide gate (Matt. 7:13) easy religion when we promised we would follow the teachings, life and example of Jesus. Jesus is our perfect example (by his Righteous acts) of God's Will for our lives. We must seek to follow Jesus in all things, meekly and humbly seeking God and God's Kingdom first (Matt. 6:33) above our own needs and desires, and relying on God's forgiveness when we fall short, forgiving others as we expect to be forgiven by God. So, let us turn our hearts to God's way, and not to selfish gain (Psalm 119:36)! Let's show by our Lights (Matt. 5:14) and our Deeds (James 2:18) what kind of Faith we have in God's anointed Spokesman, Jesus! 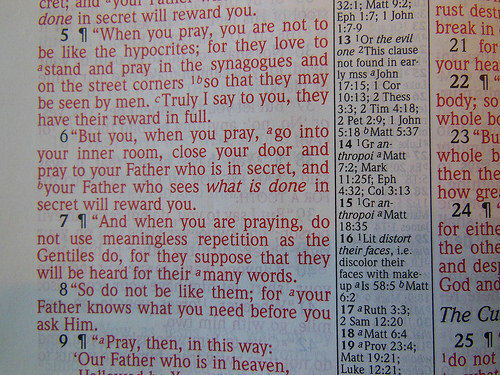 In some publications of the Gospels, the words of Jesus are printed in Red ink, while the other words around them were printed in black ink. It is a unique and clear acknowledgment that his teachings, his words, his commands, are special and unique, set apart from the other words. Which they certainly are. It is right for us to focus more intensely and more fervently and prayerfully on Jesus' words than the words around them. After all, we have one Master, and that is Jesus alone. No other man, and no others' words, carry as much weight and have as much value as his words do. Since Jesus was so in tune perfectly with our Creator, should we not listen more carefully to what he SAYS? Yes, we should. In fact, Jesus says that his words will never pass away (Matt. 24:35.) If this is true, should we not listen and obey them? Please, then, read the Red Letters. Put the into practice in your daily lives. Listen to what Jesus is saying to us. His parables all teach us that we are called by God to perform Good Works. His Sermon on the Mount teaches us guideposts for a radical Faith when we engage with others, even our enemies. 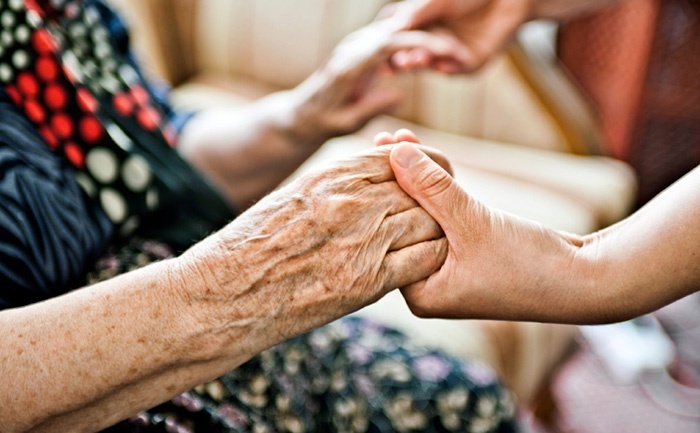 When Jesus reached out to those in need of Spiritual healing, he taught us to live lives of radical service towards others. 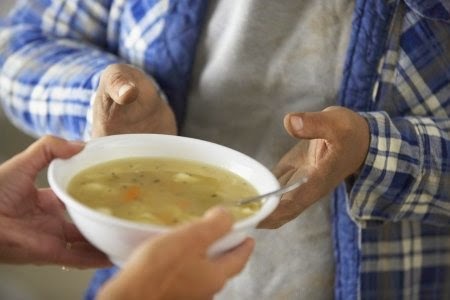 His interactions with the poor, the despised, the hopeless and the diseased teaches us that we must not shun others, but to actively have compassion for them. He teaches us to live Godly, pure and holy lives, and not to do so to heap praise on ourselves, but to honor our Creator. His calling out of the religious elites of his day teach us to be bold in our Righteous acts, and not give in to hypocrisy or to claim we are righteous because we use vain words or cling to traditions of churchmen. We are called to do all the he did, teaching others to obey his commands and bring God's Kingdom onto this earth by our acts of Righteousness, becoming more Godly each and every day. Let us read the Red Letters, and write Jesus' teachings upon our hearts, so that we may be Lights among others, living as he, himself lived.